I appreciate national science standards because they articulate a set of clear, consistent and challenging goals for science achievement for all students. This common language around a shared vision lends itself to global conversations and collaborations to enhance student learning. At the core of the Next Generation Science Standards is a focus on the student as the constructor of meaning through immersion in the science and engineering practices to learn core ideas and make connections to unifying science concepts. 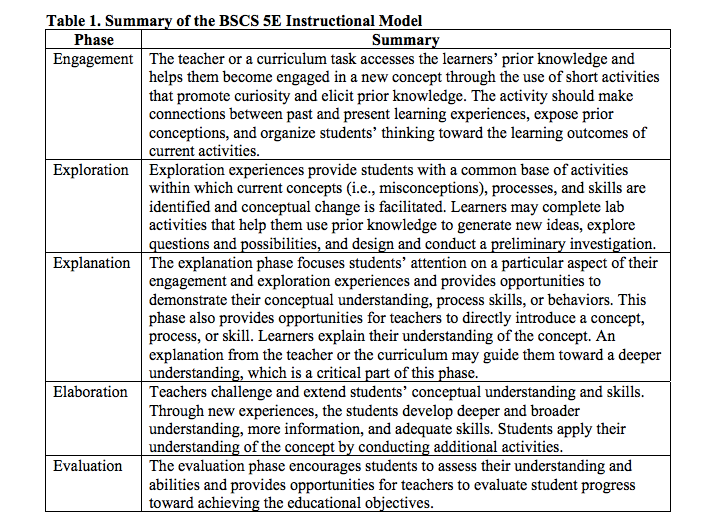 This is a conceptual shift in science education, illuminating the need for classroom experiences to reflect “the interconnected nature of science as it is practiced and experienced in the real world.” (NGSS, Appendix A). How can teachers begin to implement the Next Generation Science Standards and create this vision in their own classroom? The 5E’s framework is an effective way to plan a learning progression around a performance expectation (or bundle of performance expectations) while supporting the NGSS vision of students as the active meaning makers in the classroom. The 5 E’s framework was developed by the Biological Sciences Curriculum Study (BSCS) based on the constructivist view of learning. The 5E’s in action: students acting and thinking like scientists. As I walk down the path of NGSS implementation, the 5E’s have been a very useful tool for planning my instructional and assessment sequence, and for me to facilitate student learning. I have found that to effectively support students in this learning progression, my work centered on coaching students through questioning to help them develop their understanding. This means using formative assessment data to develop those possible guiding questions for class experiences ahead of time and seeking information on possible misconceptions before doing the actual lesson. It also means providing planned and intentional time for reflection and collaboration throughout the lesson. These shifts have resulted in a vibrant, engaged classroom focused on discovery with assessment data indicating a deep understanding of the core ideas of science. As you begin planning for the 2014-15 school year, you may want to consider starting with the 5E’s as an understandable and manageable tool to support NGSS instructional planning and provide the type of coherence between lessons needed to result in student understanding, application, and transfer of that understanding to new contexts. By starting with the 5E’s, teachers can begin to reflect on making changes to improve their craft and providing their students with well-engineered, rich, engaging learning experiences so they can achieve the goal of our national standards.